Weekly appointment planner with a 15 minute schedule on an A4 size paper in a vertical, portrait orientation. Weekly appointment planner with a 15 minute schedule on a letter size paper in a vertical, portrait orientation. 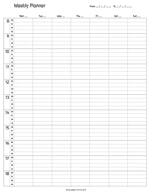 9 hour day planner on an A4 size paper in a vertical, portrait orientation. 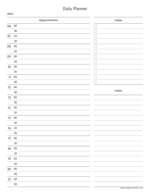 Starting at 09.00 this dateless schedule let you plan your tasks, todos and appointments by the hour. 9 hour day planner on a letter size paper in a vertical, portrait orientation. 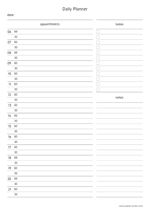 Starting at 09.00 this dateless schedule let you plan your tasks, todos and appointments by the hour. 9 hour day planner on a letter size paper in a vertical, portrait orientation. Starting at 08.00 this dateless schedule let you plan your tasks, todos and appointments by the hour. 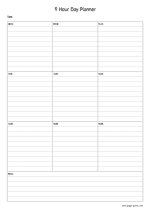 9 hour day planner on an A4 size paper in a vertical, portrait orientation. Starting at 08.00 this dateless schedule let you plan your tasks, todos and appointments by the hour.